This was to be bluebonnet day. 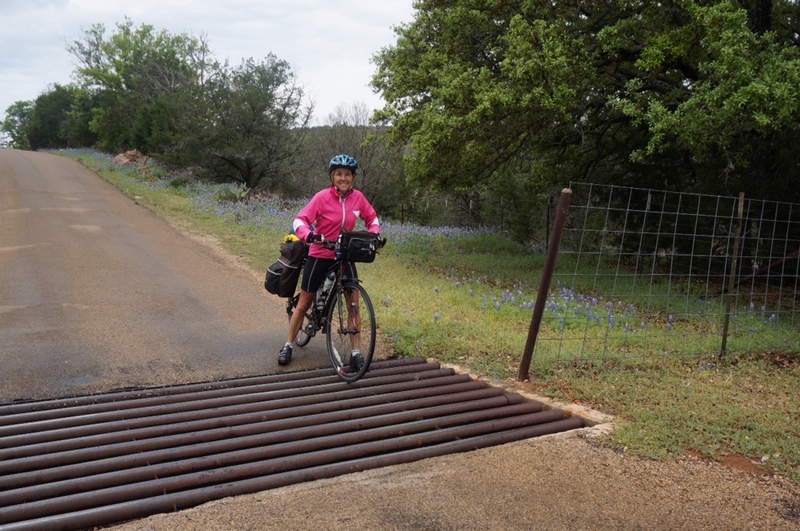 Starting in Llano, we were at the gateway to the Hill Country and headed for Fredericksburg at its core. We'd seen wildflowers along the roadsides already, but now we were ready for the big time. Of course all the locals had plenty of advice. The one thing they all recommended was the Willow City Loop. 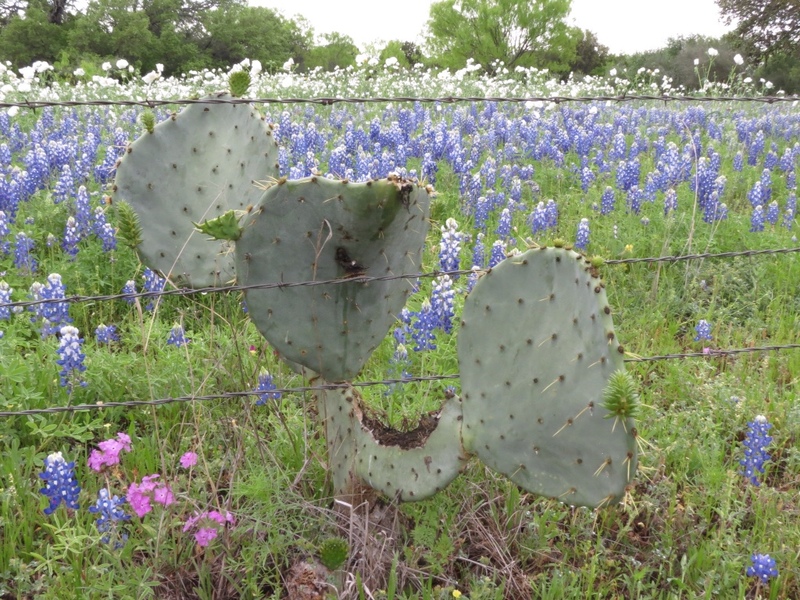 It is THE place to see bluebonnets, we were told. Since it was just off our intended route, we were all for it. 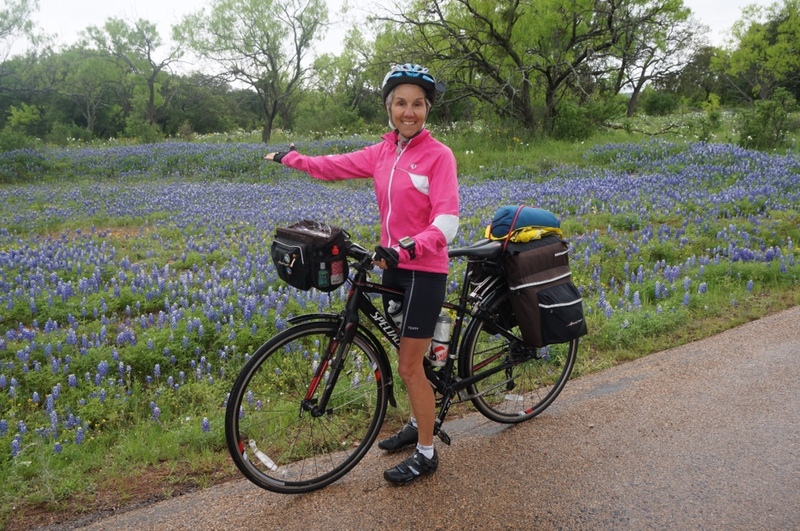 We were also informed that our timing was perfect – the bluebonnets were at their peak. Not only that, but it was the best display in years. I was excited. This is what we'd come for. The morning dawned dark and gloomy, with storms in the area. Striking out at an early hour, we felt a few sprinkles and cycled through areas that clearly had some recent rain. It didn't feel like the best day to be viewing wildflowers. But we pressed onward, willing the skies to lighten. The shoulder on the road had diminished to a narrow crumbly strip, and even on the 2-lane road the speed limit was 70 mph. So we were eager for the opportunity to divert into a smaller road. 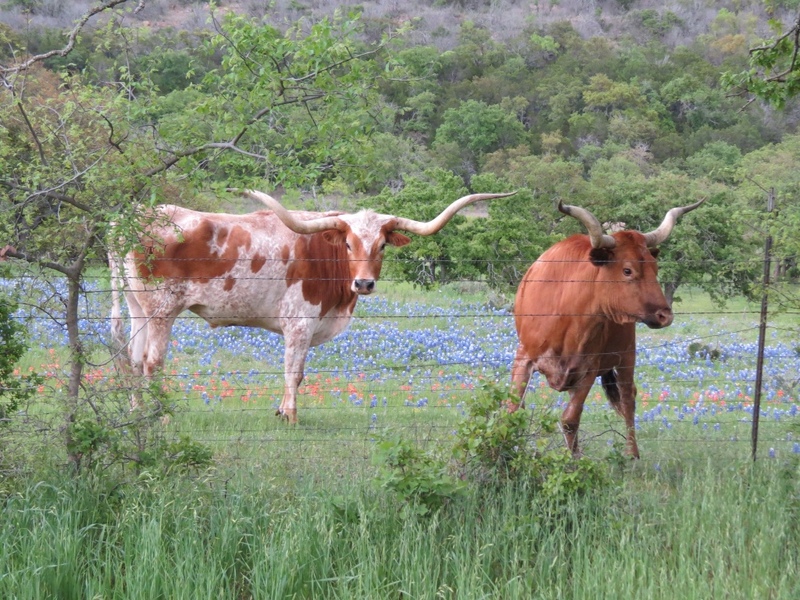 Before we did, we found a couple of buddies – two Texas Longhorns enjoying the bluebonnets as well. They didn't seem too bothered by our presence and being intent on taking their picture. Willow City Loop turned out to be a small quiet road, barely wide enough for two way traffic. The damp weather became an advantage, as it discouraged other sightseers from showing up and we had the road largely to ourselves. We were soon enthralled. For 13 miles the road wound through private land that was a haven for wildflowers. 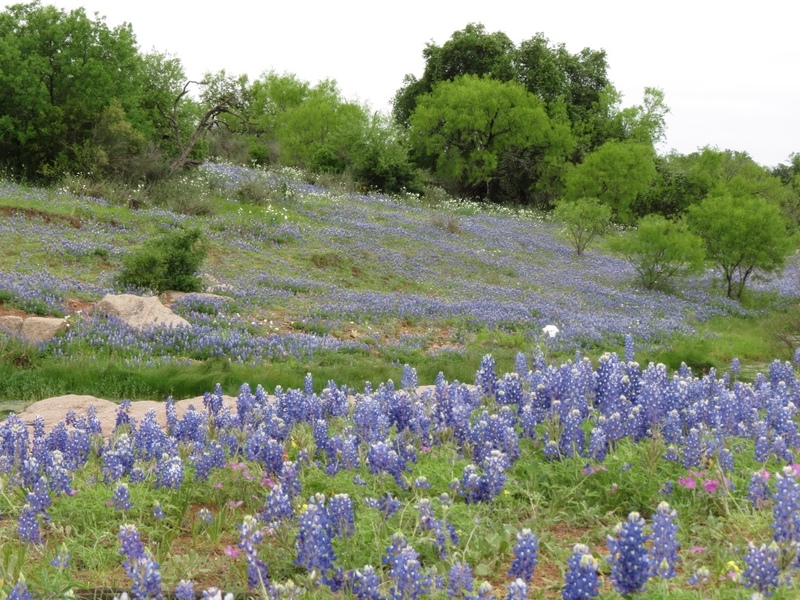 Not only were there bluebonnets, but a whole host of varieties of wildflowers which dominated the landscape. Sometimes they only lined the roadway. Other times they formed blankets of color that reached far back into the trees or covered whole fields with blue, white or red. Between each landowner, there were cattle grates in the road. While the frequent interruptions were little problem for the cars, walking over them with our bikes proved to be quite a challenge! The road curved, rose and fell and there were flowers to be seen at every twist and turn. The few cars that were there barely moved any faster than we did. Photo stops were frequent. The best part of all was being able to lolligag and gawk without any fear of traffic. And it was so quiet. Our progress was luxuriously slow, and as time went on the weather steadily improved. As the day got brighter and dryer, the number of cars increased. It made us glad for the solitude we had on the bulk of the loop. It was definitely the best display of wildflowers we could imagine. I think pictures tell it the best. 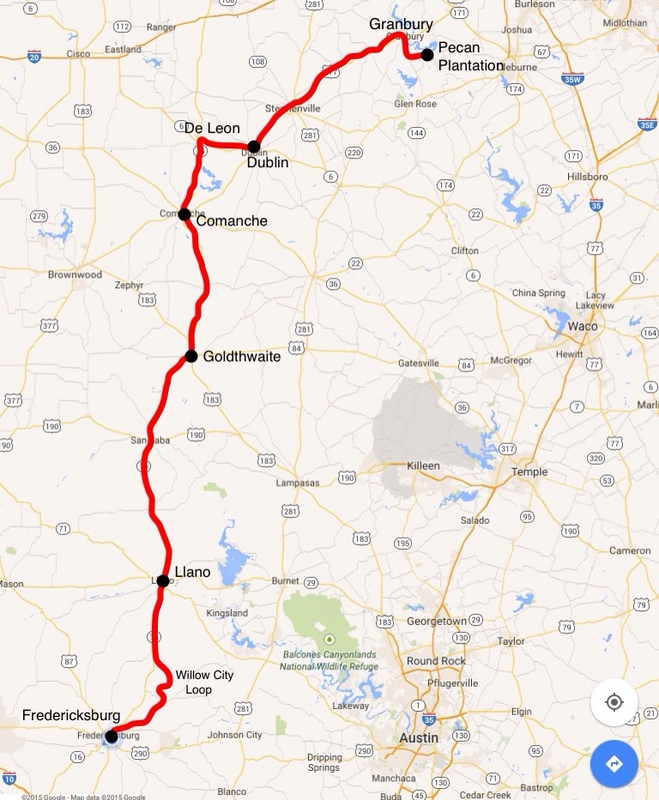 Exiting from the loop, we were able to travel the remaining distance to Fredericksburg via other back roads. 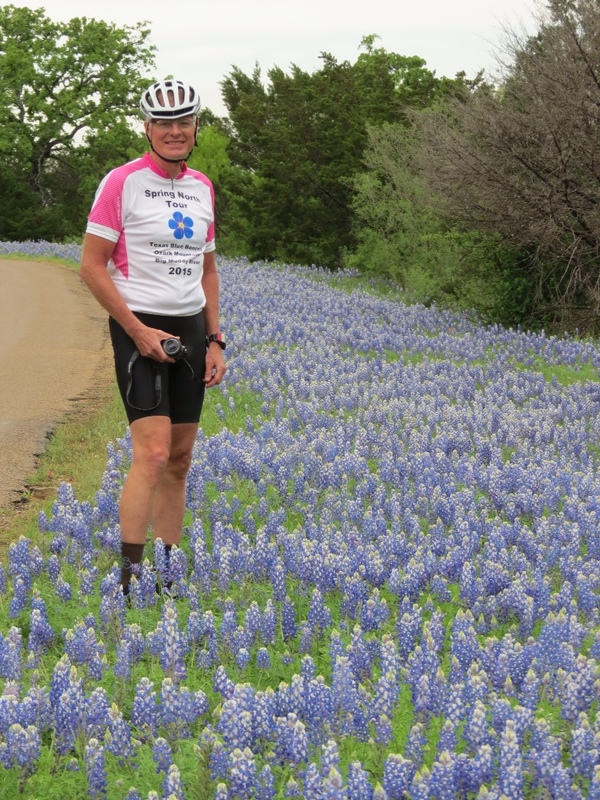 While the bluebonnets were not as much in evidence, the sun came out and for a change we had the wind at our backs. We concluded our day with dinner while listening to a local singer/guitar player on an outdoor patio in town. The perfect ending to our bluebonnet day. This entry was posted in Keeping Fit, Travel and tagged Cycling, Cycling Trip, Spring North Cycling Tour, Travel, Wildflowers by Molly. Bookmark the permalink. they bear a close resemblance to our lupine, also monkshood. 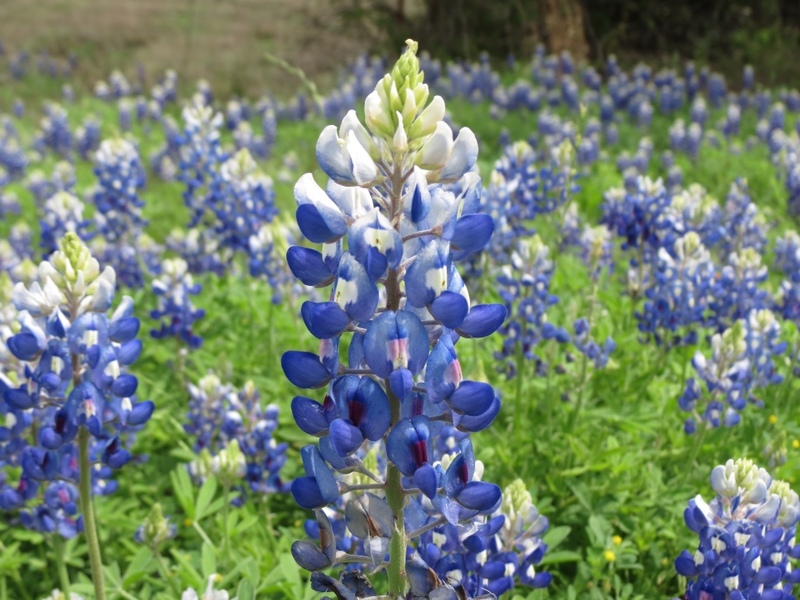 We were interested to find out that bluebonnets are in fact a type of lupine! And for once, the Texas version is much smaller than ours in Minnesota!